If you want to study for your FINRA Series 24 exam as efficiently as possible, the Series 24 Online Exam Guide is for you! Now in its 3rd edition, the exam prep guide provides a thorough overview of the tested concepts you’ll see on the Series 24 exam. 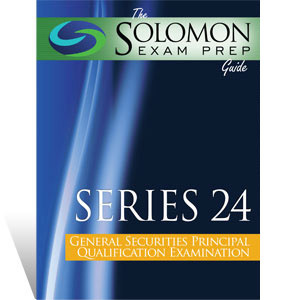 Published by Solomon Exam Prep, the Series 24 Online Exam Guide pairs nicely with the Series 24 Online Exam Simulator, the industry-leading online testing program that ensures you are learning and retaining the information. The exam study guide is available as an online digital manual via your online student dashboard (requires Internet connection/not downloadable). When I took my SIE exam, I only spent 30 minutes taking the exam and I passed. It is amazing how Solomon goes into detail regarding information. You guys provide more information than Kaplan's SIE book. Thank you so much for helping me succeed in my endeavors. Onward and upward to the Series 7. I'm choosing Solomon again! The Series 79 study materials were fantastic. Thank you!